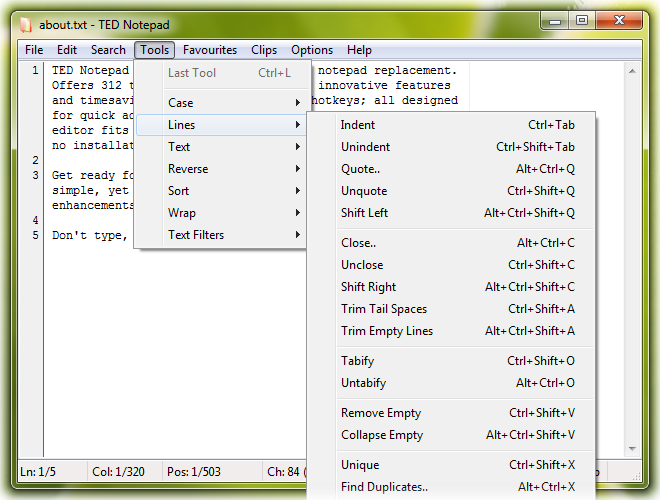 Classic freeware Notepad replacement TED Notepad has just been updated to version 6.1.1, its first release since 2011. The new build brings you drag and drop editing with either mouse button. Select text, drag and drop with the left and it’s moved; drag and drop with the right and you’ve the option to copy or move it. An extended Backup feature enables copying the previous version of the current document whenever it’s saved. The program can save multiple backups and rotate between them. The command line interface now supports opening files and working with lines at the end of the document, handy for working with logs or other regularly-updated files. The underlying engine has been brought up-to-date with support for IME composing and DPI-aware scaling. Ted Notepad’s biggest problem remains the lack of a tabbed interface. There’s no multi-document editing here: it’s strictly one-at-a-time. But on the plus side, the program does offer comprehensive support for text encodings; search and replace with regular expression support; customizable auto-completion, including HTML/ XML tag generation; multiple case conversions; versatile sorting features; tab addition and stripping; the ability to split a document into multiple files, or merge multiple files into one; and support for extending this further with custom filters or viewers (pipe your selection to a console tool, read the output and replace the original text). Not bad for a portable tool with a 122KB download. Check it out. TED Notepad is available now for Windows 2000 and later.